More Bogus Forces Charity scams and abuse. | The Walter Mitty Hunters Club. More Bogus Forces Charity scams and abuse. Rather than fill our walt hunting page with these parasite bogus money making schemes ..opps Sorry “Charity” we thought a new blog would be in order. A blog we will up date here. As most of our club member know, we have been on the backs of these so called forces charities for a while now. slowly gathering intelligence in order to provide evidence for the media to start taking note and use the information provided. Please PM us new reports and photos and if you can get a video of these people verbally abusing folk to donate in the street please send in. A. Where do the donations go to, get them to name some examples? B. What % collected is used for charity? D. How much do they get paid to collect? E. They must Visibly show you their ID and take their name. All these questions are allowed to be asked and should be answered without fail be organisations collecting charity from the public! For some reason the collectors want to hide their faces. 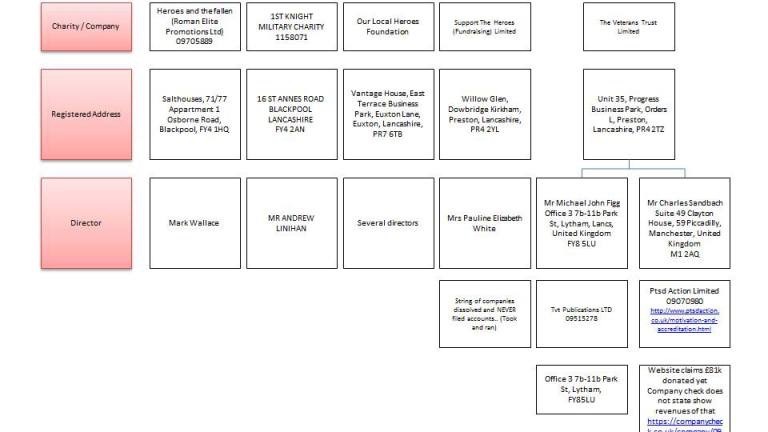 Possibly due to collecting government benefits in one post code and working for these charity companys in another. Who knows? The collectors then get very aggressive and most times call the police or site security in order to get rid of the problem of a simple set of questions. If they do not display and in-date and visible ID card that allows them to collect, Report to the police and write an official complaint to the shopping center or local council who are allowing them to pitch up. and write a complaint with the shopping center or local council who are allowing them to pitch up. The more official complaints the more chance of removing the parasites! The Invicta foundation have been getting reported a fair bit for being abusive and accusing people of not being patriotic for not donating. In other words attempting to publicly humiliate people into giving them money. This is not what Charity is about! The invicta Foundation has nothing to do with the Invicta Games, set up by HRH Prince Harry! However, the invicta Foundation and its promotions executives have deliberately allowed the public to make that assumption by cleaver word play. Just like most of the other charlatans who use “Heroes” on their banners. But lets take a look at the invicta foundation accounts. full time events manager and a part time business development manager. Hard to see how that is feasible on staff costs of £10,246 in 2015 let alone paying for legal fees. Fixed assets only amount to about £9,000 (which could mean anything – not necessarily property) and rent to about £3,000 so I wonder what sort of housing could be provided? I don’t want to be too quick to make judgements but those who assert this is kosher might like to add some explanations to the accounts. £1200 paid to trustees for lighting and heating in their own homes? Of course all these Charities claim to be fully legit due to having a Charity registration number, But as proved before with such charities like Angel of Heroes and Our Local Heroes for example. Both had Charity registration reference numbers to make them look legit. But………………. 1. There’s Klingons on the starboard bow with the invicta foundation again. This time at the Birmingham NEC Star Trek convention. The guy on right tried too intimidate the club member and got aggressive then called security to remove the person asking simple questions. If you see them. Please do politely ask them the same questions and take photos. If they are abusive file a complaint with the NEC media team. Mersey square shopping centre , Stockport. 5. These lot Scamming at the Middlesbrough Cleveland shopping centre. The scammers ran and hid before their mug shots could be taken. 6. In Romford essex. Scamming an old lady of her pension getting her to part with £20, she only wanted to by one ticket at £2.50 each, but heard giving the hard sell on how she would be helping the troops. External links highlighting the various bogus charity scams. Where these charity scams are using injured vets as a “front man” in order to convince the pubic. Only for the Vet to find out he is being used. Petition to regulate All forces charities. Please sign. Please get this page to as many facebook pages as possible. The General public need to be educated. These scams are taking much needed funds from the real forces charities and their stalls will be out in force over the next three months. Keep sending in your photos and videos and we will up date this blog and re-post each time. Well done for exposing these con-artists. It’s just a shame they are allowed to carry on doing this. Keep up the good work. Slightly concerning that the person who is mentioned above is a SAAFA case worker. Last time I looked it was SSAFA and anyone even remotely involved with them would know what the correct name was. We acknowledge receipt of your enquiry. A response will be issued providing your enquiry falls within our regulatory remit. Please do not send us a paper version unless we have specifically requested this. I was stopped in Harrogate outside the Victoria Shopping Centre on the 5th May 2017 by a charity worker selling wrist bands for PDSD. I was given a email address to access help for abuse. A 12 week course is what they said I could get help with. The name of the person promoting this help was a Micheal Figg. He was willing to give me his name, I did buy a wrist band and have emailed them but a friend said it sounds odd as it was just a Gmail account and thats what lead me to search for the charity. I couldn’t find it but did find you. I feel totally used and violated as they lied to me about a subject that is close to my heart. They did say they were in the process of getting a magazine up and running about domestic, emotional and other kinds of abuse. I worked for a security company called Wallace Security way back IN the Early 90’s based between York and Hull on the A1079. Mark Wallace isn’t something to do with that is he?